When I was 18, I dated a boy named Paul. Paul was obsessed with Elizabeth Taylor, it made me mad jealous! The only thing I knew about her was in sixth grade when my language arts teacher explained what the word "understatement" meant. 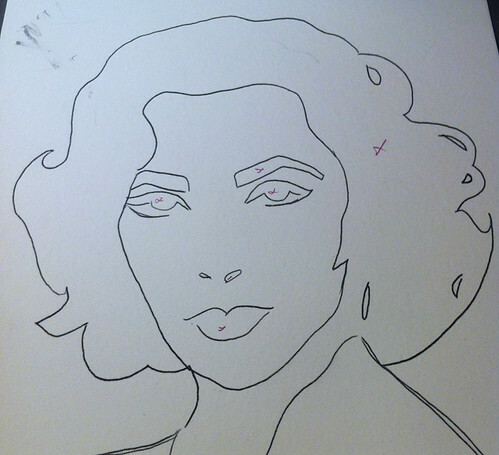 Her example: "Elizabeth Taylor likes to get married." So until I met Paul, I thought she was a crazy actress with a string of husbands. I had yet to see her films. One night I asked Paul why he liked her so much. He answered by taking me to the video store so we could rent A Place in the Sun, Cat on a Hot Tin Roof and what would later become one of my all-time favorite flicks, Giant. That night, I fell in love with Elizabeth too. I remember going home to inform my mom, only to find out that Elizabeth was her favorite actress too! Paul and I eventually broke up, but I'll always remember and thank him for turning me on to classic Hollywood films, mostly for Elizabeth Taylor. Her movies even helped strengthen the relationship with my mom! From then on, whenever my mom and I had rough patches between us, we would watch a Elizabeth Taylor movie to serve as a buffer - a happy medium to bring us together to laugh again. Some people wonder why we care so much about a dead celebrity. For me, she was more than that. She was a talented and gifted artist who brightened the lives of so many people. Her work helped us escape the stress of daily life, and her campiness, humor and devotion to charities showed us she was more than just celebrity, she was a real person with a diamond-encrusted heart. My daughter is now a big Elizabeth fan too, and I decided to make this shirt for her. 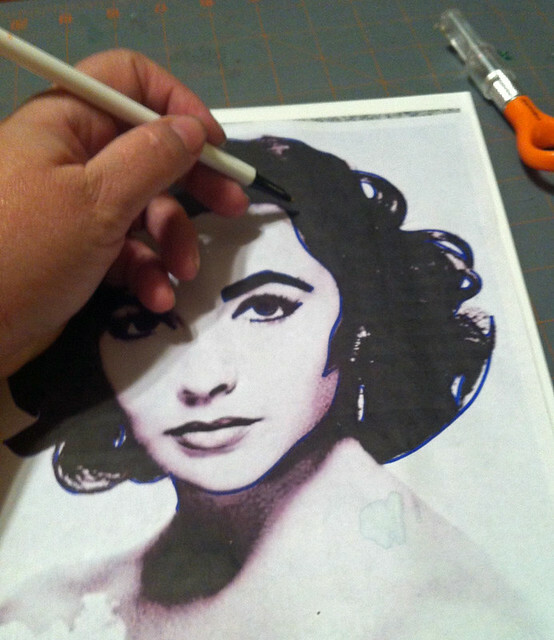 Viva Elizabeth Taylor! 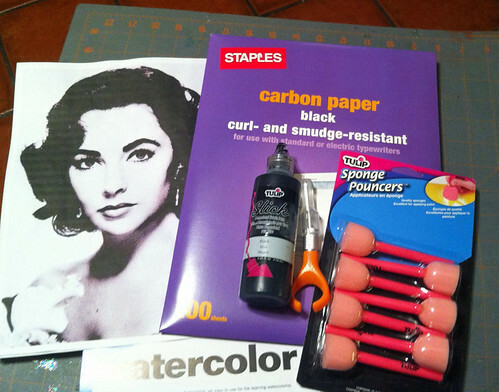 Supplies: An 8x10 print-out of a clean black and white image, carbon paper, ballpoint pen, watercolor paper, Tulip Sponge Pouncers, Tulip Black Fabric Paint (3D slick or Soft Paint), craft knife, self-healing cutting mat, Tulip Fabric Glitter Spray. Set the picture on top of the carbon paper, and then the carbon paper on top of the watercolor paper. Trace the BLACK areas with the ballpoint pen. 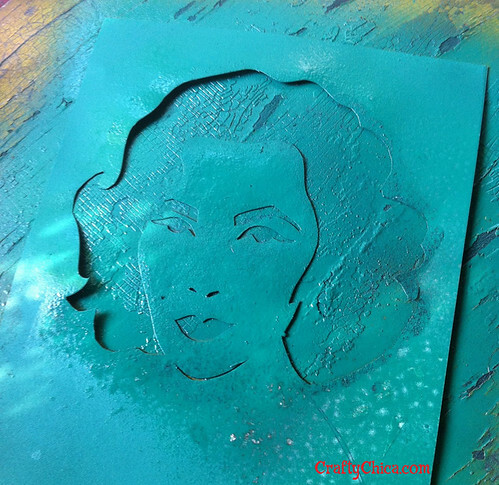 NOTE: I have used freezer paper stencils before, but always use watercolor paper for my hand cut stencils so I can reuse them. Put an "X" on the black places, this is where you will cut. Cut out all the black areas. 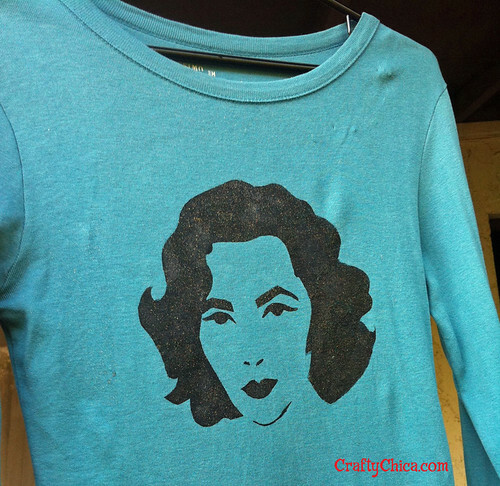 Set the stencil on your shirt (insert a t-shirt form) and tape down the corners so the stencil won't move. Apply paint to the pouncer and add color all over the open stencil areas. Hold down edges with your fingers. 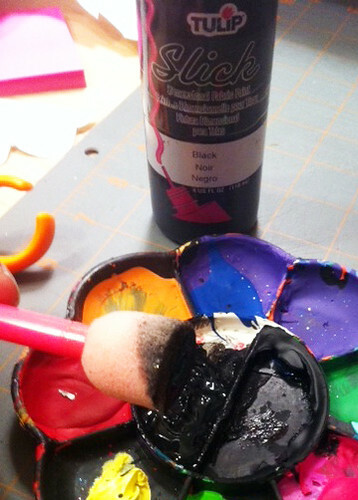 Let the black paint dry, and then add the Tulip Glitter Spray. Let dry. 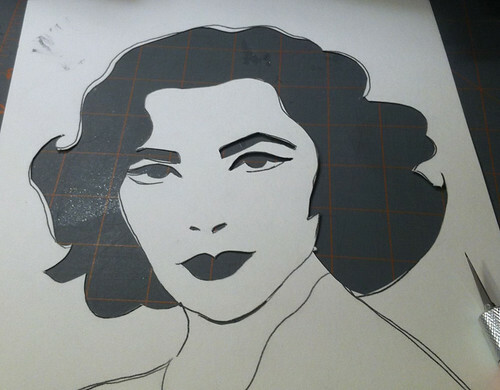 Peel off the stencil. Here you have the finished shirt! My husband said she needs crystals, so I may add those next! 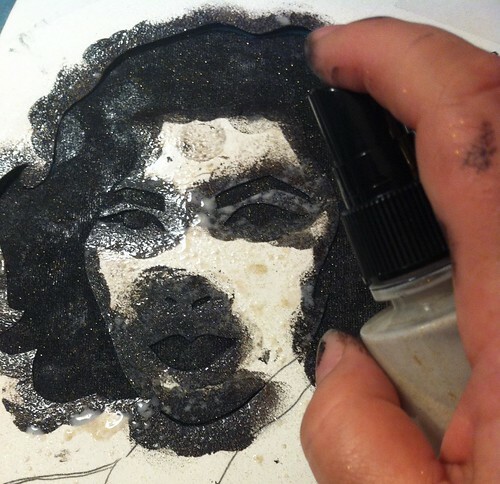 Preserve your stencil! Spray it with glossy spray paint, it will dry thick and flexible so you can use it over and over again! Here is my favorite Liz Taylor scene from Giant. Enjoy! Click here for today's daily giveaway! THis is an awesome project! I was up late last night watching a marathon tribute to her. She had an amazing life! This is a great project! I had done a similar project using a handmade stencil. A fun tribute to a wonderful actress & beautiful woman! Hi Kathy, that was a terrific little history lesson on an amazing individual. Loved your step by step instructions too. Also, I wasn't aware of using glossy spray paint to make stencils re-usable so thanks for mentioning that! Your site article is very intersting as well as fanstic,at the same time your blog theme is exclusive and ideal,great job.To your success. I love Giant. I don't know what it is (probably being from Texas) but we watch it just about every Sunday afternoon. I have four kids under the age of 6 and they like watching it too. Its entertaining for everyone. I am going to make a shirt just like this for me and my girls. 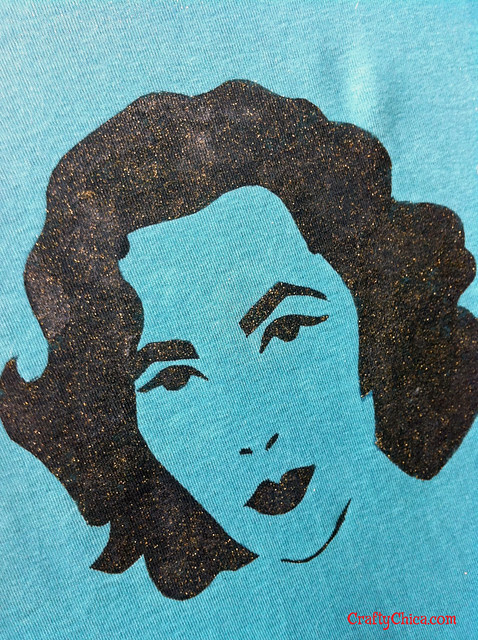 Plus who doesn't Love Elizabeth Taylor. thanks a bunch. You are definitely one of my craft heroes! !